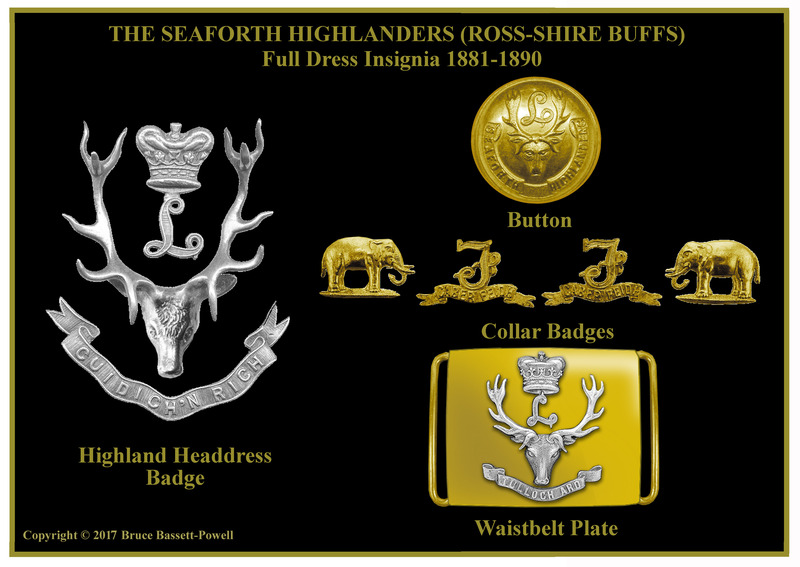 The Seaforth Highlanders (Ross-shire Buffs, the Duke of Albany’s) Formerly the 72nd and 78th of Foot. The Stag’s Head and the motto Cuidich’n Right (Help to the King), which is said to have been given to the regimentally associated Mackenzie family as a reward for saving King Alexander II of Scotland from the attack of a wounded stag. Also the mottos: Cabar Fiedh (Antlers of the Deer) the war cry of the Seaforths. Additionally the Coronet and Cypher of the Duke of Albany, which was a second title of the old Duke of York and an honour of the 72nd. The Elephant with ‘Assaye’, which commemorates the services of the 78th, at the battle of that name. 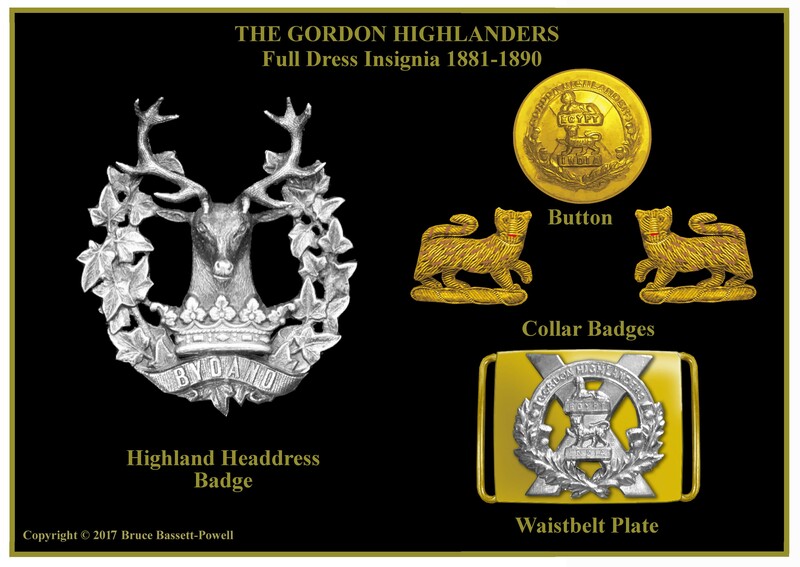 The Gordon Highlanders Formerly the 75th and 92nd Foot. The Royal Tiger, which commemorates the services of the 75th in India. The Sphinx superscribed ‘Egypt’, commemorates the services of the 92nd in Egypt, 1801. The Head of a Stag. With antlers of ten branches issuing from a ducal coronet and with a wreath of ivy, the crest of the Marquis of Huntly, the ivy being the badge of the Gordon Family. Additionally the Motto: Bydand (Watchful). 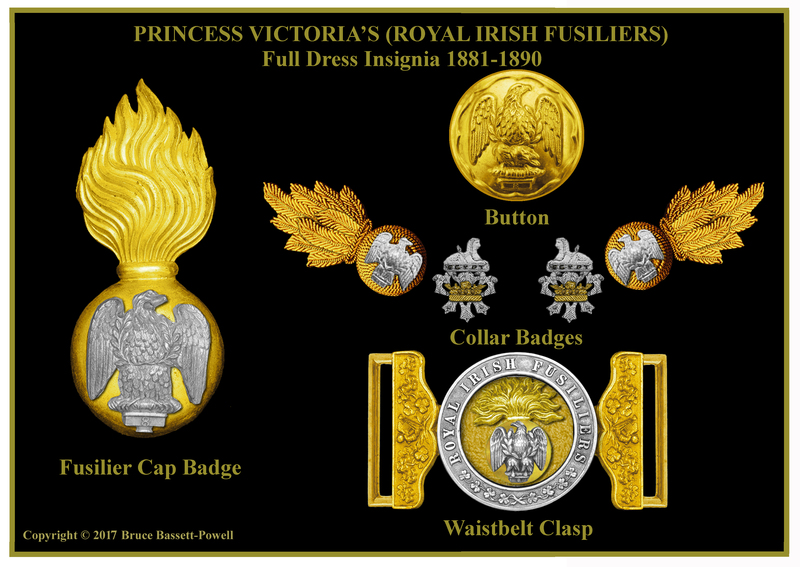 Some other honours, are not worn on insignia. The Queen’s Own Cameron Highlanders Formerly the 79th Foot. The Sphinx superscribed ‘Egypt’, which commemorates the services of the 79th in Egypt, 1801. The Thistle ensigned with the Imperial Crown, the design of which is that of the Royal Badge of Scotland and given by Queen Anne in 1707. Also the Cypher of Queen Victoria within the Garter. The Royal Ulster Rifles Formerly the 83rd and 86th Foot. The Sphinx superscribed ‘Egypt’, which commemorates the services of the 86th in Egypt, 1801. The Harp and Crown and motto Quis Separabit. Also the Bugle-horn. 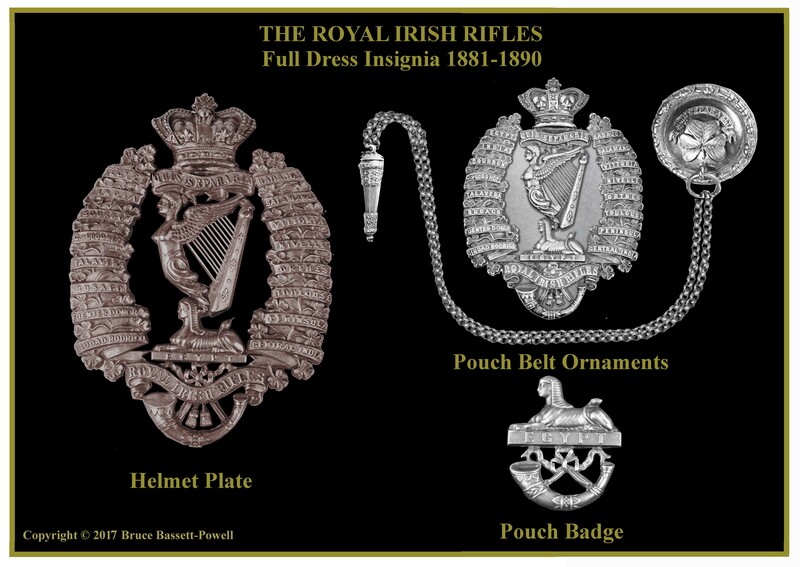 The Royal Irish Fusiliers Formerly the 87th and 89th Foot. The Sphinx superscribed ‘Egypt’, which commemorates the services of the 89th in Egypt, 1801. The Harp and Crown, an old badge of the 87th. Also the Prince of Wales’s Coronet, Plume and motto, which was adopted by the 87thin 1793. Additionally the Cypher and Coronet of Princess Victoria, granted in 1866 when the 89th received the title Princess Victoria’s. 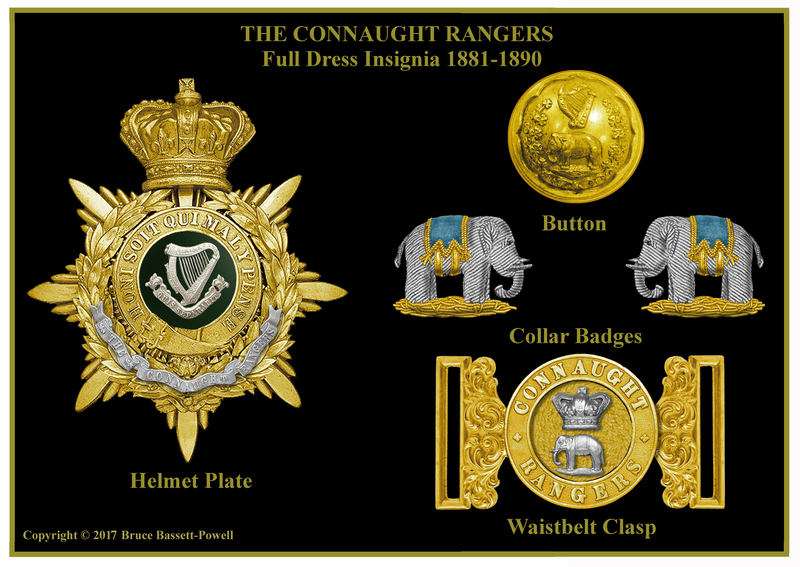 The Connaught Rangers Formerly the 88th and 94th Foot. The Sphinx superscribed ‘Egypt’, which commemorates the services of the 88th in Egypt, 1801. The Harp and Crown and motto Quis Separabit, which was the old badge and motto of the 88th. Also the Elephant Caparisoned, with the Honour ‘Seringapatam’, which was given to an earlier 94th regiment in 1807 and authorised for the successor 94th in 1874. 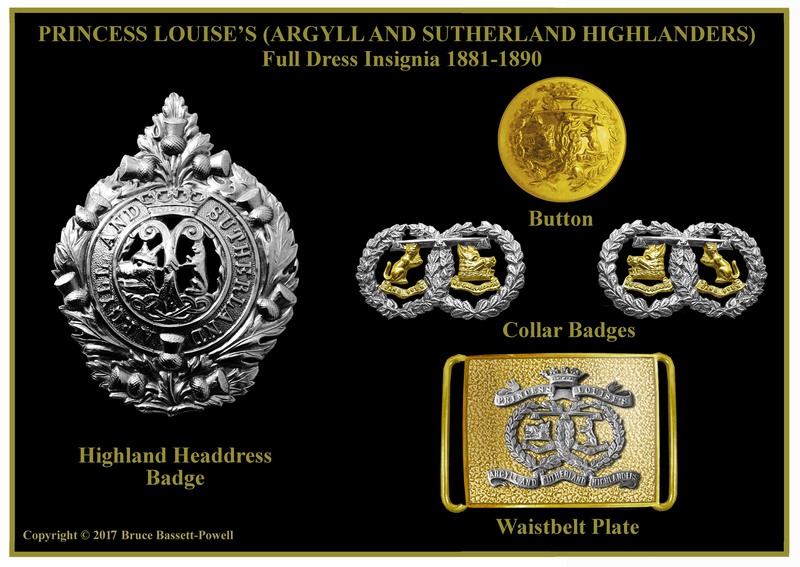 The Argyll and Sutherland Highlanders (Princess Louise’s) Formerly the 91st and 93rd Foot. The Wild Cat and Butcher’s Broom, which is the family badge of the Sutherland Clan. The Boar’s Head, which is the badge of the Argyll family, and Myrtle, which is the badge of the Campbell Clan. Also a Silver Label of Three Points, which is the cadency of HRH the Princess Louise, Marchioness of Lorne. Additionally, the Coronet of HRH the Princess Louise. 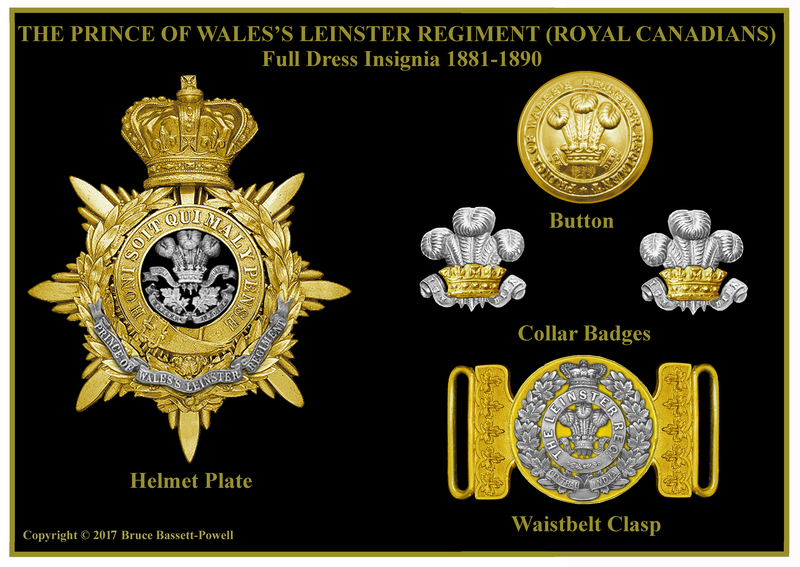 The Prince of Wale’s Leinster Regiment Formerly the 100th and 109th Foot. The Prince of Wales’s Coronet, Plume and motto, which was given to an earlier 100th regiment and authorised for the successor 100th in 1860. Also the Honour ‘Niagara’, which came from the same forebear, was awarded in 1875. Additionally, a Maple Leaf that commemorates the raising of the 100th Prince of Wales’s Royal Canadians in Canada, in 1858. 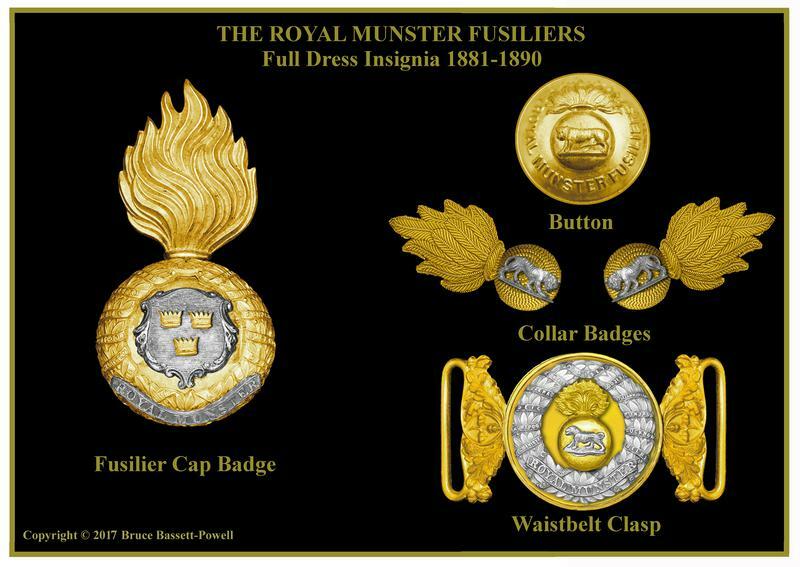 The Royal Munster Fusiliers Formerly the 101st and 104th Foot. The Royal Tiger, which was awarded to the 1st Bengal European Regiment, the pre-1861 forebear of the 101st. Additionally the Arms of the Province of Munster, that was also the ancient arms of Ireland and which was adopted in 1881. 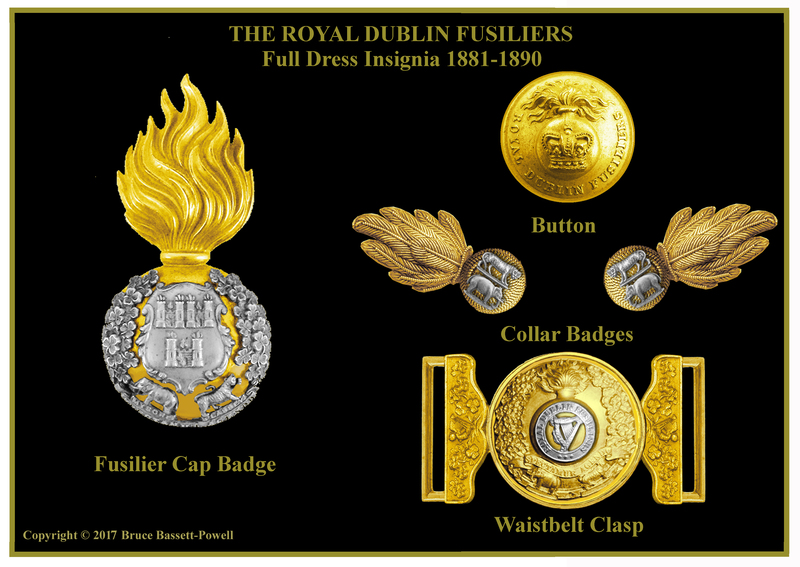 The Royal Dublin Fusiliers Formerly the 102nd and 103rd Foot. The Elephant, which commemorates the services of the 1st Bombay European Regiment, the pre-1861 forebear of the 103rd. Also the Royal Tiger, which commemorates the long and distinguished services of the 1st Madras European Regiment, the pre-1861 forebears of the 102nd. Additionally the Arms of the City of Dublin, which was an old badge of the Royal Dublin City Militia. 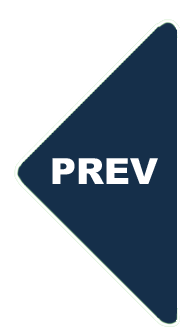 Note: Formed in 1662, the 103rd’s forebears were significantly senior to the 102nd’s forebears, but unusually took the junior position because Madras was the senior Presidency. 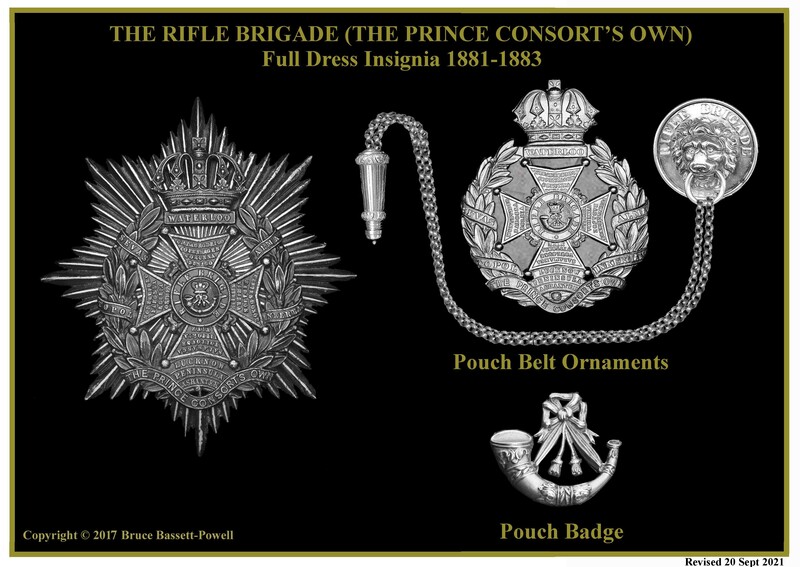 The Rifle Brigade (Prince Consort’s Own) One time 95th Foot. A Bugle-horn and Crown, which was the original badge of the regiment. 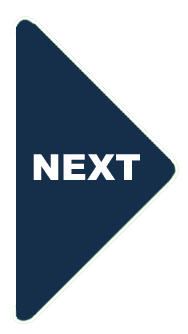 Also a Cross, in the style of the Order of the Bath, long used on insignia to bear the regiment’s battle honours, as colours were not carried by rifle regiments. From 1822 the cross was altered to reflect the Guelphic Order and an eight looped crown was adopted until 1902. An additional honour, a Naval Crown, was not granted until much later.